All In Moving Services is a full fledge moving service provider holding specialization in moving their customers in more professional yet affordable manner. The company deals in various types of moving and strive to offer an exceptional and unique moving experience for the clients. They are expert in moving all residential and commercial spaces within or across the country. Other than moving, the company also offers a huge variety of other moving related services that are packing, unpacking, loading, unloading and transporting your goods from one place to another. They take care of each and everything once you’ll choose them as your movers because they are the one whom you can easily rely upon. All the movers of the company are highly trained and qualified in performing their jobs impeccably perfect and on right time thus assuring you a good quality of moving process in more reasonable rates. They all will come with fully equipped trucks and packing material and will pack and load all your belongings with utmost care and responsibility in keeping the safety measures of the goods in mind. With this company, you need not have to worry about anything related to your relocation. 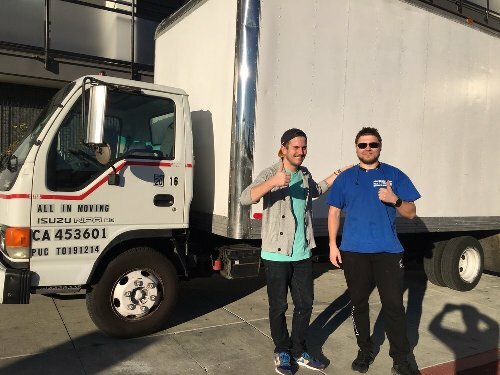 All you have to do is to just call them and book them as your movers and there you are ready to have a unique and memorable moving experience with them. All In Moving Services was established in 2012 with a prior motive of making moving an easy and stress-free process. In order to boost up the industry with qualitative and affordable moving services, the company started out operating at very minimal cost and offered high standard moving services to the clients so as to offer them a luxurious and exceptional moving experience. As a result of which they became the no. 1 preferred and reliable movers of the town making moves super simple, stress-free and memorable with their excellent moving services. And today also the company strive to offer the same quality in all-inclusive rates and is bound to work with the utmost honesty and integrity making all of their customers 100% satisfied and happy about their moving. 926 N Ardmore Ave, Los angeles.